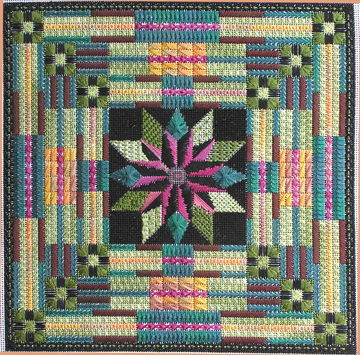 Prairie Garden, the final design in the series based on a traditional quilt block, is a sampler of textural stitches which are derived from cross stitch and satin stitches. The model is worked entirely in silk, but most Caron Collection threads are also suitable. Choosing other colors, or using one color only, will create an entirely different mood. As shown, the design (left) is approximately 9" square on 18 count. 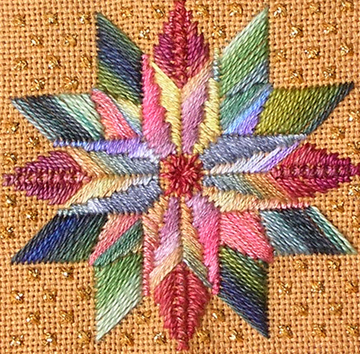 Shown right the center design as an ornament. Directions for other sizes and colorways are suggested in the instructions.